You dream of a land where man lives in absolute harmony with nature. A new frontier of human ingenuity and creativity where that which is beautiful in each person could be nourished so that every entity could express their unique gifts and purpose for being on the planet. A perfect post-2012 utopia? In Valchiusella valley at the foothills of the Piedmont Alps in northern Italy, about 40 kilometres from Turin, a community of around 1,000 people is living that phantasmagoric dream in an eco-village called Damanhur (City of Light). Named after an ancient city near Alexandria in Egypt, Damanhur is hailed by the UN as a model for a sustainable future. Esperide Ananas and Crotalo Sesamo, ambassadors from Damanhur Federation, at Bengaluru’s Pyramid Valley. 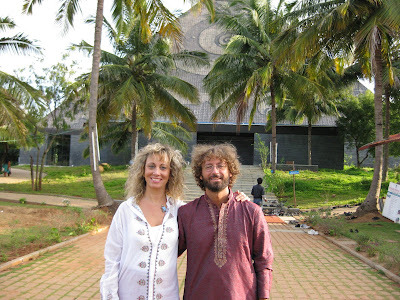 Two ambassadors from the Federation of Damanhur, Esperide Ananas and Crotalo Sesamo, who visited Bengaluru recently as delegates to the Global Congress of Spiritual Scientists organised at the Pyramid Valley, shared with us an enthralling experience of one of their most recent offerings: Music of the Plants. Part of Damanhur’s research into plant consciousness, the concert of the plants is a heartwarming interaction between man and nature. You sing a Carnatic raga, and the plant responds with an improvisation on those sequences of musical notations! Each plant has its own song, and they respond differently to each musical strain of various instruments. Esperide Ananas and Crotalo Sesamo had brought biofeedback sensors and synthesizers with them from Damanhur. They “trained” a few local flowering plants and creepers picked up from a Bengaluru garden for the concert. They hooked up sensors to the root and a leaf of the plant. Electrical impulses from plants are passed on to a synthesizer, which converts them to sound waves. The synthesizer actually assigns a musical sound to each of the different ‘blips’ that the plant emits. In this incredible concert, the plants began to sing, almost rivaling a classical vocalist, a flutist, a guitarist and a harpist. "Numerous living species of plants and animals are disappearing, impoverishing culture and diversity, as well as the precious resources of our world,” said Esperide Ananas, Communications Director of Damanhur Federation. “Damanhur is like the formation of a new cell in opposition to this involution. Our intention is to create a new people with a new culture and civilization – a people based on the exaltation of differences in which everyone, thanks to their own characteristics, represents a precious piece of the whole mosaic." What began as a secret cult, a small band of dreamers led by a young visionary tax consultant, Oberto Airaudi (Falco) in 1975 in Turin has flourished into a self-governing federation with its own constitution and a territory extending over 500 hectares in Valchiusella and the Alto Canavese area at the foothills of the Piedmont Alps. The large eco-society, based upon spiritual values and human solidarity, has become a pioneering research centre for alternative energy, organic farming, integrated therapies. It boasts of a viable economy with its own currency (Damanhur Credito is on par with Euro), business enterprises, schools and an Open University offering courses in such esoteric subjects as astral travel, and “selfica” healing, involving the use of alchemical liquids and metals. Members live collectively in group houses, each home having around 20 people of a wide age range, the idea being that learning is enhanced when people live in a multi-generational context. The oldest member of the community is 85. Recently, the birth of “a grandchild in the community” was a big event in Damanhur. People of any nationality or religion can become a citizen in Damanhur. First, you are asked to “come and see.” The newcomer will be accommodated in guesthouses for a while. After a series of interaction and interviews, if you are found fit to be a member of the community, your application will be processed and approved. You have to contribute your skills and talent in any specialised field in art, science or business. Citizens adopt new names derived from the combined names of animals and plants such as Sparrow Pinecone, Skipper Butterfly, Rattlesnake Pineapple etc, as a way of being reminded of the interconnectedness of all species. The community offers various forms of marriage, including one year renewable contracts as well as legal arrangements for those who desire to be lifelong partners. If a couple desires to have a child arrangements can be made with the community for financially supporting the child until age 14. Children are not acknowledged as members, but are considered to be guests of the community until they are 18, when they are invited to choose whether or not they wish to become members. The walls and hallways of the temples are completely covered in murals, stained glass, sculptures, mosaics and massive columns. It spreads over 8,500 cubic metres on five different levels, connected to one another by hundreds of metres of corridors. In some areas the ceilings are as high as 25 feet. One room is a four-sided pyramid covered in mirrors and topped with a glass dome. The ceiling of the Hall of Spheres is covered entirely in gold leaf. "The Temples of Humankind are an underground work of art, created entirely by hand and dedicated to the divine nature of humanity. It is a great three-dimensional book which recounts the history of Humankind through all the art forms, a path of re-awakening to the Divine inside and outside of ourselves. In the Temples, every aspect has a meaning: the colours, the measurements and every detail follow a precise code of forms and proportions; every Hall has its specific resonance and its own sound," said Esperide Ananas. And the incredible legend is that the entire project – excavating the earth and rock, constructing the massive and intricately decorated architectural complex underground – was all done in utter secrecy! Since there was no government sanction for excavation or building, the temple had to be built by stealth, underneath a house where they “pretended to throw parties and played loud music to detract attention from the noise of construction.” It took 15 years for the small group of non-architects, working four-hour shifts around the clock, to complete the work. Then, a map of the secret temple fell into the hands of a local judge, through a former member of Damanhur. Troops were called in to "destroy the terrorist cult under the mountain." When they descended to storm the temple, they were overwhelmed forced to stop in their tracks as they gazed up at the magnificent structure with its massive columns and breathtaking artistic work. Now the whole world acknowledges the Temples as “a great laboratory where art and science, technology and spirituality are united in the research of new roads for the evolution of humanity." Time to pack up and head towards Damanhur, folks. We Indians would definitely fare better in such a communal living environment - sans politics of course! Look at what happened to Aurobindo's (and Mother's) dream commune Auroville in Pondicherry.